Fifty years ago today (April 12), cosmonaut Yuri Gagarin blasted into Earth orbit, marking the beginning of the human spaceflight era. In humanity's first half-century as a spacefaring species, government-run space programs put people on the moon and began to master low-Earth orbit. The next 50 years should bring a sea change, with commercial companies taking over near-Earth operations and freeing NASA and other space agencies to send astronauts to asteroids and Mars. The seeds of this transformation are being sown now, as private companies ramp up their spaceflight capabilities and start finding ways to make money in Earth orbit and beyond. "We're in the midst of a paradigm shift right now," said scientist Alan Stern, vice president of the space division of the Southwest Research Institute, a nonprofit organization based in San Antonio. "In 15 years we'll likely look back and say, 'That was a special time. That was pivotal.'" Since Gagarin's historic achievement, human spaceflight has been the province of nations, with government agencies such as NASA launching people into space for scientific reasons, or as expressions of national pride. But that's all about to change, because private spaceflight is set to take off, making access to space far cheaper than it's ever been. Multiple companies are developing their own spaceships and their own plans for making money in space. Virgin Galactic, for example, could start taking tourists on suborbital joyrides as early as 2012, at $200,000 per seat. More than 400 people have already bought down payments for such a trip, according to company officials. Other firms are jockeying for position in the suborbital-tourism race, including Blue Origins, Masten Space Systems, XCOR Aerospace and Armadillo Aerospace. Orbital tourist trips might not be far behind suborbital jaunts. Various companies — including Space Exploration Technologies (SpaceX for short) — are developing crewed vehicles that could take paying customers to the International Space Station, or perhaps the commercial space station under development by Bigelow Aerospace, which is helmed by hotel tycoon Bob Bigelow. And spaceflight might become a regular part of our day-to-day travel around the planet within the next 50 years, some space industry insiders say. Vehicles that rocket through space on their way from San Francisco to Sydney, for example, could turn a taxing 14-hour trip into a short jaunt. "In 50 years, companies and government agencies may have tackled the technological challenges that will enable point-to-point rocket or hypersonic transportation," said Virgin Galactic president and CEO George Whitesides. "For the last 50 years, the average speed of air travel has not changed — we are certainly overdue for a significant major advance." "People need to figure out business models by which you can monetize other aspects of human spaceflight beyond tourism," Stern told SPACE.com. "Bob Bigelow has one, with his space station. We need 50 Bob Bigelows." Those other commercial opportunities may include mining asteroids for precious metals, or extracting the moon's ample water stores to produce rocket fuel, which would be sold to spaceships at orbiting filling stations. Indeed, some businesses are already planning out such ventures. The private firm Shackleton Energy Company, for example, plans to send robotic scouts to the moon in the next four years and hopes to be selling propellant in low-Earth orbit by the end of the decade. If some of these ideas pan out, more and more entrepreneurs and companies might see business opportunities in space. The effects could snowball, and the proverbial heavens could soon open up. "Fifty years in the future, I would hope that millions of people have had the opportunity to travel to space, and that thousands of people live there," Whitesides told SPACE.com. "I think outposts on the moon and Mars are entirely possible, with tourism to the lunar surface an expensive but possible activity." The coming explosion in commercial spaceflight capabilities should free up NASA to explore farther afield than it ever has before. NASA is retiring its space shuttle program later this year after three decades of service. The agency is counting on companies such as SpaceX to take up the burden of ferrying astronauts to and from low-Earth orbit over the long haul. "If others are able to take that on, then we can concentrate on exploration and discovery, which are really what we're here for," said Doug Cooke, associate administrator for NASA's Exploration Systems Mission Directorate. NASA is already eyeing destinations beyond low-Earth orbit and the moon. President Barack Obama's vision for the nation's human spaceflight future calls for NASA to send astronauts to an asteroid by 2025, and then on to Mars by the 2030s. NASA has many reasons to send astronauts to Mars — chief among them to search for evidence of life on the Red Planet, be it past or present. And astronauts could well be looking for microbes in the Martian dirt before 2061 rolls around. "I think in this timeframe, we could easily have sent people to Mars," Cooke told SPACE.com. "We may have gone there repeatedly." Excursions to the moon or asteroids would likely come first, Cooke added, to help astronauts and scientists map out a Mars trip. And a journey to the Martian moon Phobos is another potential intermediary step. "You'd be right at Mars, and you could teleoperate [robots] on the surface," Cooke said. "Yet you wouldn't have to take the full step of landing on Mars, which is a big deal." NASA is on its way toward developing the capability to get beyond low-Earth orbit. But the space agency isn't quite ready to launch astronauts to the Red Planet yet. Among other things, NASA needs to develop larger spaceships that can accommodate crew on a potential six-month trip to Mars, for example. And it must come up with a heavy-lift rocket, Cooke said. "The biggest first step is a heavy-lift vehicle," Cooke said. "It's incredibly important. 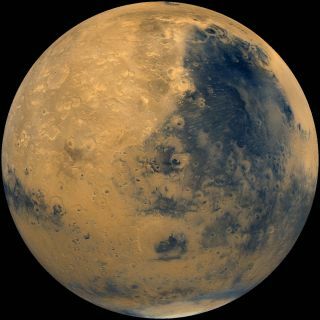 We're going to have to launch the equivalent of the full-up space station that we currently have in orbit to get to the Martian surface and back." New entry and landing systems would also be needed for a manned Mars mission, as would effective ways to protect journeying astronauts from dangerous space radiation. The scale and cost of such a mission mean that NASA likely wouldn't be going it alone. "We will probably do this in an international effort, which will benefit all of the world," Cooke said. NASA's space shuttle has had two fatal accidents in 133 manned missions. The safety record of Russia's Soyuz vehicle is comparable. Private companies will probably have to do better than that, or tourists, scientists, educators and anyone else won't risk flying with them regularly. "The trick is to have the fatalities be rare enough to be acceptable," Stern said. "Currently they are not, because the shuttle and similar systems have fatalities too often on a per-flight basis." Stern thinks an order of magnitude improvement in the safety of commercial human spaceflight — one accident every 500 or 1,000 flights, say — might be enough to get people taking to the heavens regularly. For his part, Whitesides thinks that human spaceflight might make huge safety strides in the next half-century, perhaps becoming as reliable and routine as plane travel is now. "I think travel to LEO [low-Earth orbit] could approach the safety of commercial airplane travel in that timeframe, if not much sooner," Whitesides said. "Through the use of new technologies and safety systems, we should be able to make significant advancements in space safety, as we are doing today at Virgin Galactic." If all of these factors line up, humanity could escape from the boundaries of its home planet as never before by 2061. We could establish an extensive and protracted presence in Earth orbit, on the moon and beyond, experts say. Stern is optimistic that this push into space is under way, facilitated by the improving capabilities of private spaceflight. "We're seeing that the private sector can do human spaceflight, and do it at radically less expensive price points," he said. "I believe in 200 years, when people look back, they will see this as the pivotal breakout in human spaceflight."